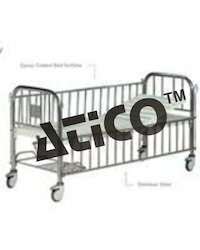 Offering you a complete choice of products which include infant bed child cot, epoxy coated steel, semi fowler bed for children, with side railings, swaddling table and infant bed. Infant Bed / Cot, size: 810 x 460 x 960 mm. Completely made of Epoxy Coated Steel. 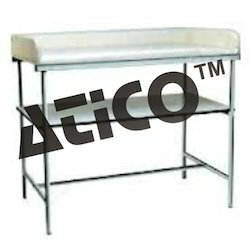 1 shelf at the bottom & guard rails made of epoxy coated steel. Semi-Fowler Bed with mechanically operated Back rest by crank mechanism. Size: 1880 × 880 × 580 mm. Epoxy coated mild steel frame work with 2 section top. Upper part covered by foam-rubber and padded by leatherette. Framework made of mild steel epoxy coated finish. 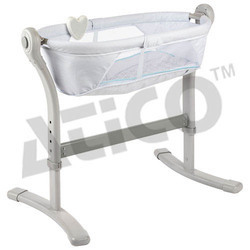 INFANT BED / CHILD COT / BABY BASSINET, Size 870mm L x 530mm W x 920-1070mm H.
Height Adjustable by Gas Spring 920-1070mm. Moulded Plastic Crib (without joints) with clear visibility for observer. Smooth Rotating Castors 100mm Dia will provide silent transportation. With 12 Trendelenburg (TR) & Reverse Trendelenburg (RTR) position. 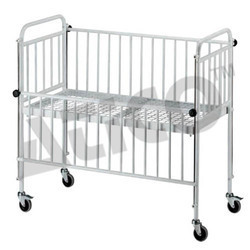 Looking for Hospital Baby Crib ?